<<John Mackey may be a true libertarian, but that doesn’t make him any less wrong about what he said or what he meant. He claimed to be using the “standard dictionary definition” of “fascism.” I don’t know which dictionary he was consulting, but neither of the ones I checked, Webster’s Third New International (the standard for American English) or the OED (the standard for British English), defines “fascism” in any way remotely akin to Mackey’s erroneous explanation. He seems to think that Obamacare is fascistic because it gives the government control of the “means of production” in health care. Really? I must have missed the part of the Affordable Care Act that makes the federal government responsible for all pharmaceutical production, ownership of all hospitals, the hiring and firing of all doctors and nurses, the manufacturing of all medical devices, and the operation of all medical schools. Those are the means of production in health care, and if Obamacare doesn’t reserve all those functions to the federal government–and I’m pretty sure it doesn’t–then Mackey doesn’t have a goddamned idea of what he’s talking about. You know plenty of highly credentialed economists and political scientists; maybe one of them could send him some helpful literature on the subject. In addition, it’s appalling that anyone would try to excuse Mackey’s inadvertent revelation of what he really thinks by claiming that he is a “true libertarian.” In another breath-taking show of ignorance, Mackey stated, “We no longer have free-enterprise capitalism in health care.” No longer? As if we ever did? In a health-care system operated under free-enterprise principles, there would be no governmental support for medical research of any kind, no Centers for Disease Control, and no public health measures of any kind (no regulations for air or water quality, no food inspections, no vaccination programs). Is he really talking about giving up all that for the sake of some sort of ideological purity? In free-market health care, emergency rooms would not have to treat those who could not pay on the spot for treatment. In free-market health care, the poor or misfortunate would die of whatever disease they could not afford medicine for. The vast majority of those deaths would be of children. You wrote in an earlier post that the social contract between American elites and the rest of the country seems to be broken. 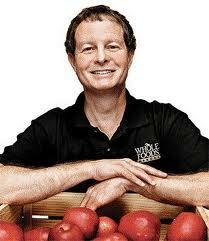 John Mackey’s statements are emblematic of that rupture. He may be a genius at getting people to buy cherries at $24.99 a pound, but otherwise he is just the grinning public face of extreme Social Darwinism. And his statements about Obamacare should be treated with the same fascinated wonder that attaches to the Higgs boson: they are the God particle of stupidity on that subject.